Halle Berry cracks a new universe in EXTANT. c 2014 CBS Broadcasting. Oscar-winner Halle Berry makes a smooth transition to broadcast TV in her new 13-episode series, Extant, debuting tonight on CBS (Wednesday, July 9, at 9:00 p.m. ET/PT). With executive producer Steven Spielberg and director Allen (The Sopranos) Coulter at the helm, atmospheric cinematography and equally distinctive music, plus a top-notch supporting cast, the premiere episode of Extant does not disappoint. If you’re a fan of The Stepford Wives and Rosemary’s Baby, which Extant seems to reference at this early stage, you’ll be hooked from the get-go. Berry stars as Molly Watts, an astronaut who returns home after a 13-month solo mission in outer space. In a perfect world, Molly’s transition back to her family and work on terra firma would be challenging. But in this scenario set in the not-so-distant future, she is short circuited by seen and unseen menace. Molly must come to grips with the fallout from a mysterious encounter in her space station and the shady goings-on by her superiors at the International Space Exploration Agency (ISEA). Also muddying the waters are the loss of two beloved colleagues and the moral issues swirling around her scientist husband, John (Goran Visnjic), whose Humanics project aims to humanize robots. Exhibit #1 at John’s fund-raising show-and-tell is the Woods’ creepy son, Ethan (Pierce Gagnon). 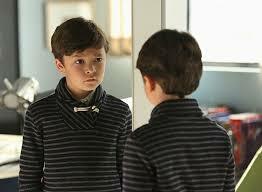 Will Ethan (Pierce Gagnon) ever learn to love? Photo: Robert Voets/CBS Broadcasting. A tantalizing mix of sci-fi, mystery and thriller, the premiere episode of Extant, the brainchild of screenwriter Mickey Fisher, is riveting. Hopefully, his next 12 episodes will match the promise shown here and will prove to be a savvy vehicle for Halle Berry’s return to series TV. This entry was posted in TV and tagged Allen Coulter, Artificial Intelligence, Extant, Family Relationships, Goran Visnjic, Halle Berry, Mickey Fisher, Science Fiction, Space Exploration, Steven Spielberg, Thrillers. Bookmark the permalink.